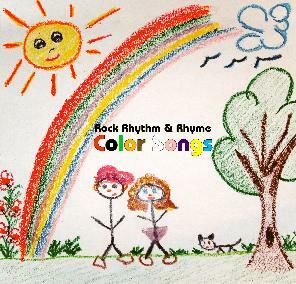 Rock, Rhythm, and Rhyme recently sent me a sample of their new CD: Color Songs. LoveBug (my 15-month-old daughter) was thrilled to open her “present” that came in the mail, and enthusiastically nodded a big “YES” when I asked her if she wanted to listen to some of her music. I put the CD on in our living room and we ended up listening to it through twice while dancing wildly and clapping loudly. As far as my daughter’s concerned, this is one good album. 🙂 I now keep it in the car and we listen to it during drives. Filled with learning, fun, songs and activities, this live show will have your preschoolers constructively engaged in dance, movement, and just plain-silly-fun. Entertaining and educational, your preschoolers will participate and interact in musical activities and sing-alongs. The upbeat tempos and sounds of Rock Rhythm and Rhyme make every event a creative and fun experience. The songs take you through 10 different colors, talking about common objects of that color and also teaching you how to spell that color. At first, I felt that the music could benefit from being more intricate (okay, that’s coming from a girl who played Chopin’s Fantasie-Impromptu at the age of 15), but then I realized that LoveBug responds best to simpler melody lines and instrumental accompianments. You’ll have to listen to the music yourself to get a feel for the music’s texture on this album, but let me just say that it’s fun, easy to follow, upbeat, and CLEAR. Your child isn’t going to get distracted or confused, yet things flow well and are complimentary to each other. I like that even though you can tell each song is part of the same album, the songwriters have put a lot of different flairs into each piece, making every one a little different in it’s style. From rock-and-roll and ballade feels to rap and island influences, your child won’t zone out from one song to the next (although you might have the words “Green, G-R-E-E-NNnnnn” running through your head for a while). After critically examining this album for its musical quality (oh how I hate off-key boring kid’s music–it will NOT be found in my house! ), educational and developmental purposes, and my daughter’s reaction to it, I can definitely say that it will be played in my house for a long time to come, and I myself would pay the $15.00 for it. It’s so hard to find GOOD infant and toddler music, that I think it needs to be snatched up whenever possible! Rock, Rhythm, and Rhyme wants to give one of my readers his or her own copy of their album! To enter, please visit their website, listen to their songs, and tell me which one you like the most. If you’re unable to listen, then I guess you’ll have to read the titles and tell me which one you think may be your favorite. 🙂 You must leave an email address and separate comment for each entry. The contest will end February 11th at 3:00pm, EST. * Otherwise spread the word about this blog! I can't decide between the black and pink. I like both. Not only is brown my favorite color, I really liked the song! I have your button on my blog, entry 1. I have your button on my blog, entry 2. I am going to add your Valentine's Day button right now! Green is my favorite. I like the instrumentals. I really like that each song is a color! I love the purple song! I like the brown song. my favorite is pink, its my daughters favorite color, i think she would love the song!